Missions is an exciting area of ministry at St. Mark’s. We know that God not only wants to work within us, God also wants to work through us. We are answering God’s call by reaching out locally, nationally, and internationally. We work to demonstrate the love of Jesus Christ to others by sharing our service as well as our gifts. St. Mark’s is a longtime supporter of the Community Food Bank of Southern Arizona, a local organization that receives donated food or contributions from individuals and businesses, as well as the U.S. government. In addition to distributing food to the hungry, the CFB helps people become self-sufficient by focusing on education, advocacy and food production. Over 97¢ of every dollar raised goes directly to food and programs; less than 3¢ goes to administrative costs. 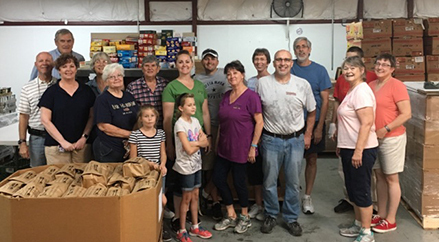 In addition to monetary support through its Missions Committee, St. Mark’s also organizes groups of volunteers who travel to the CFB several times a year to physically pack emergency food boxes. Emerge! Center Against Domestic Abuse is a domestic violence service in Tucson providing help for people dealing with domestic abuse. They offer one-on-one support and education to victims and survivors who have experienced domestic abuse, including domestic abuse education, crisis intervention & safety planning, 911 emergency cell phones and goal planning assistance. They also provide referrals for clothing, financial assistance, housing, employment, Department of Economic Security services, medical assistance, advocacy, parenting services, victim compensation, relocation, and Starting Over Supply kits. Their support groups provide a safe place for survivors of domestic abuse – including their children – to receive support and education covering a wide variety of issues. They provide lay legal advocacy services to help participants work with the criminal justice system. This year, 2018, Emerge! celebrates its tenth year of serving Tucson’s community. How to get involved with Emerge! : make a monetary donations or volunteer your time, talent and/or skills. October is Domestic Violence Awareness Month with special activities occurring during the month. Interfaith Community Services (ICS) has been compassionately serving the needs of Pima County seniors, individuals with disabilities and people in financial crisis since 1985. St. Mark’s is proud to be one of the founding faith communities for this admirable organization and continues to support ICS through both monetary donations and volunteers. Additionally, members of the congregation regularly donate non-perishable food items for the ICS Food Bank. St. Mark’s is a longtime supporter of The Primavera Foundation, which provides pathways out of poverty through safe, affordable housing, workforce development and neighborhood revitalization. In a given year, 7,500 individuals and families seek a way out of homelessness, a way to find work, a way to become homeowners. Primavera works with these individuals and families on their way to economic self-sufficiency by providing programs that focus on survival, stability, security, and sustainability. In addition to monetary support through its Missions Committee, St. Mark’s also provides the evening meal for approximately 110 homeless individuals at the men’s shelter on the 2nd Saturday of each month. (If a month has a 5th Saturday, St. Mark’s provides that dinner, as well.) These dinners are prepared and served by members of the congregation who have volunteered individually, or as part of a group or class. Interested volunteers may contact the church office (297-2062) and sign up or use the board located in the entryway of the Sanctuary and sign up for any of the available dates. We also encourage you to look over the booklet “Cooks In The Kitchen” which includes recipes, tips on how to prepare a meal for 100, directions to the facility and other useful information. St. Mark’s is also a longtime member of Tucson Interfaith HIV/AIDS Network (TIHAN), an organization that provides compassionate and non-judgmental service to those affected by HIV/AIDS. Through education and support, its members (as individuals and faith communities) work to build bridges, reduce stigma and sustain hope. TIHAN members show care through education, service and advocacy. In addition to monetary support through its Missions Committee, St. Mark’s members also regularly donate toiletries, cleaning supplies and paper products for those living with HIV/AIDS, as these are items that cannot be purchased with Supplemental Nutrition Assistance Program (SNAP) benefits. Once a year (generally in September), volunteers from St. Mark’s help prepare and serve the meal at POZ Café (TIHAN’s monthly program providing lunch and social opportunities for HIV+ persons). TMM was previously known as “Tucson Metropolitan Ministry” and began in 1974 as a social services outreach of various local churches, the United Way, and other entities. TMM has assisted in the development and growth of now-independent organizations like the Community Food Bank, Miracle Square Apartments, and Traveler’s Aid. TMM offers a vast variety of programs to Southern Arizona that include fostering children removed from their home by CPS, transitional housing for single mothers and their children, subsidiary housing, and a First Time Homebuyer & Home Repair program. TMM’s ReStore sells slightly-used and outlet home improvement items such as furniture, lighting, flooring, and appliances at huge discounts. Community Closet sells donated clothing at prices well below retail costs in addition to offering a voucher program that helps clothe Tucson’s most needy. All proceeds of both stores directly benefit the programs of TMM. In addition to monetary support through its Missions Committee, members of the St. Mark’s congregation regularly donate gently-used clothing and household items for the ReStore and Community Closet. BorderLinks is a nonprofit educational organization based in Tucson that focuses on cross-border relationship-building opportunities, issues of immigration, community formation and development, and social justice in the borderlands between Mexico, the U.S., and beyond. On average, nearly 1,000 individuals participate annually in BorderLinks learning opportunities. Church World Service (which began in 1946) works with partners to eradicate hunger and poverty and to promote peace and justice around the world. CWS is active in more than 30 countries globally and is a member of the ACT Alliance, InterAction and ICVA. St. Mark’s has a long history of providing monetary support to Church World Service, particularly for its Blankets+ program, which supplies blankets and other emergency supplies in the wake of a disaster. The United Methodist Committee on Relief (UMCOR) is a non-profit organization dedicated to alleviating human suffering around the globe. UMCOR’s work reaches people in more than 80 countries, including the United States. It provides humanitarian relief when war, conflict, or natural disaster disrupt life to such an extent that communities are unable to recover on their own. In addition to annual monetary support to UMCOR through its Missions Committee, St. Mark’s offers the congregation the opportunity to contribute to special offerings when large natural disasters or other emergencies occur in the world. Members give generously, knowing that 100% of their designated gift to UMCOR will be used for relief purposes. Other national/global programs often supported by St. Mark’s include Africa Upper Room Radio Ministry, the Heifer Project, Kairos Prison Ministry, and more. St. Mark’s UMC organizes an annual adult mission trip. In coordination with organizations such as Sierra Service Project, UMCOR and 1Mission, St. Mark’s sends a group of adult volunteers beyond the borders of Tucson and its surrounding communities. Click on the links below to see some of St. Mark’s Adult Mission Trips. South District Middle School Mission – Each summer, young people who have completed grades 6-8 by the end of the school year are eligible to participate in the Middle School Mission. The students, who come from several South District United Methodist churches, participate in service projects throughout Tucson and stay overnight at St. Mark’s. This event teaches younger youth that they are capable of making a difference, and that there are needs in their own community. It also prepares them for the high school summer missions. High School Mission (Sierra Service Project/SSP) – SSP is a Christian non-profit organization providing life-changing experiences through acts of service repairing homes in Native American and urban communities. High school age youth are invited to experience the power of serving people who have a culture and life experience different from their own. For more than 30 years, St. Mark’s has sent a team of teens and their adult chaperones on a weeklong SSP trip. During the days spent on the site, participants meet and work with people from other churches. The experience is profound.